Another Virginia native, red trillium is a springtime perennial that can be found in flower from April until June. Luckily for us, the individual scarlet flowers can persist for up to a full month. All the trilliums arise from an underground rhizome and have triangular-shaped leaves that whorl around an unbranched stem. As the name Trillium implies, the floral parts occur in multiples of three. The deep maroon-red color, along with the beautiful symmetry of the petals, sepals and leaves, make red trillium a visual gem in the forest. A trillium primer might be in order here: there are two basic kinds of flowers in the genus Trillium. The distinction between the two lies in how the flower is arranged on the stem. If the flower hangs from its own pedicel (if the flower has a stalk), then the trillium is placed in a group called the wakerobins. If there is no pedicel or stalk on the flower (in other words, if it appears to be sitting right on the leaves–or sessile), then the trillium is put in a group called toadshades. A good example of a toadshade can be seen here. The flowers pictured on this page are wakerobins. Notice how each flower hangs from a dainty pedicle, which is suspended above the leaves. The flowers have a tendency to droop over from this thin stem, hence one of the common names: “nodding wake-robin”. Now comes the hard part. What are the actual species pictured here? Is this Red Trillium (Trillium erectum), otherwise known as Stinking Benjamin because it smells like a wet dog in order to attract flies as pollinators? (darn!–we can’t smell these photos!) Or is it Southern Red Trillium (Trillium sulcatum), whose sepals are supposed to be distinctive because they are keeled at the tips like a boat? Both species have a dark-colored ovary (red or maroon), and both can vary in petal color from red to creamy white. So which is it? I don’t know–please set me straight if you know which is which! Either way, trillium seeds are dispersed by a variety of insects and small mammals, but especially by ants. 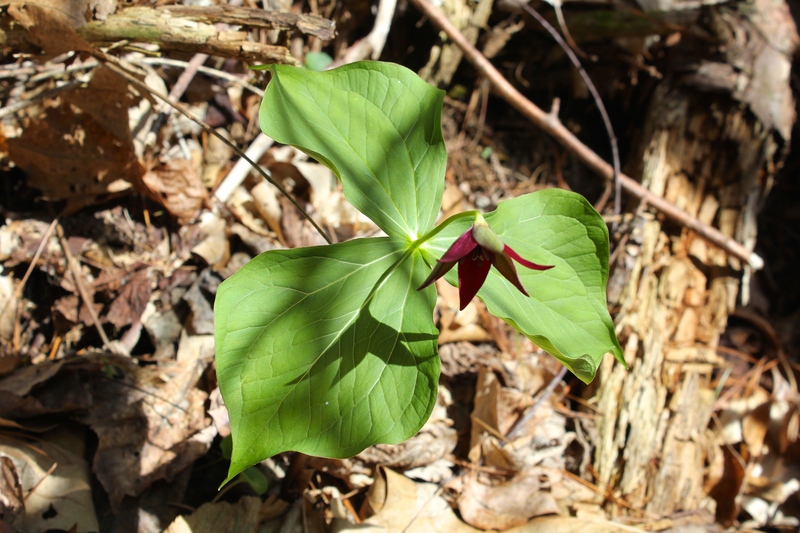 Red trillium has been used as an herbal medicine. It is reported to have antiseptic and astringent qualities and was used for the treatment of illnesses as far-reaching as gangrene, bleeding, and snakebites. The photos below were taken at Mountain Lake (above the lodge) and Rock Castle Creek Gorge. The second group were taken at a spot on the Blue Ridge Parkway near Floyd. That group had a large number of white flowers mixed among the red-flowering plants. The others are from Glen Alton in mid-May and Bottom Creek Gorge Conservancy in April. Group 2: The white flowers may be the form albolutescens.